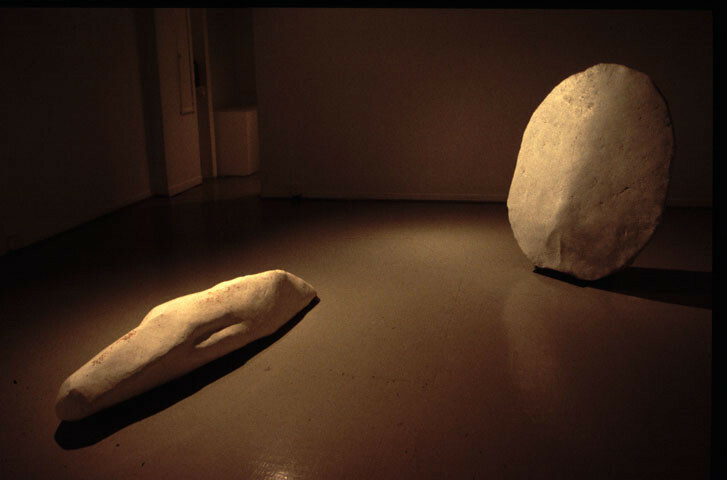 White Shield and Shadow, 1998-1999, plays with the echo of the corporeal in reflection to the natural. The White Shield is exhibited in connection to a second piece that is bound to the floor. This second element is an amorphous form and has roughly the size of a person (180cm x 50xm in diam.) It is round and relatively flat on the bottom. Both ends converge to a round tip. The form does not reveal its nature through a readable image. It works with a "likeness". 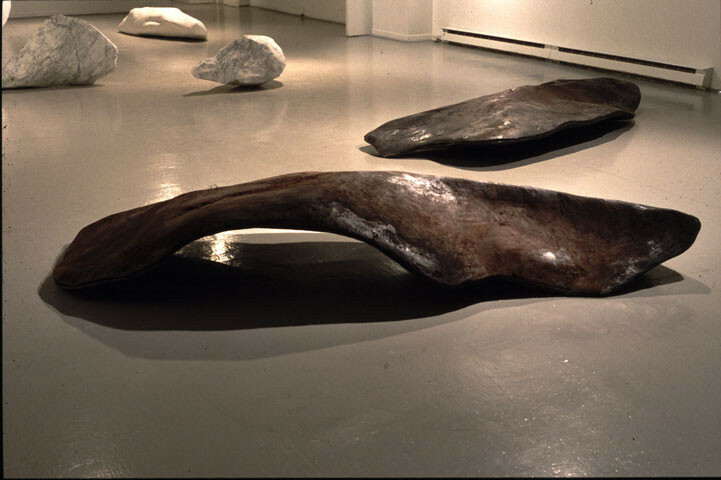 The form is worked in plaster over wire and then layered with iron oxide and graphite so that it has a dark, almost black, earthy color. The surface is tight, yet heavily marked and rough. In Shield and Shadow, the shadow takes on an individual form. It manifests an identity that relates to the viewer's body before it makes sense as a shadow cast by the shield. The piece shifts between the two poles of culture and nature that form a basic element of most of my work. 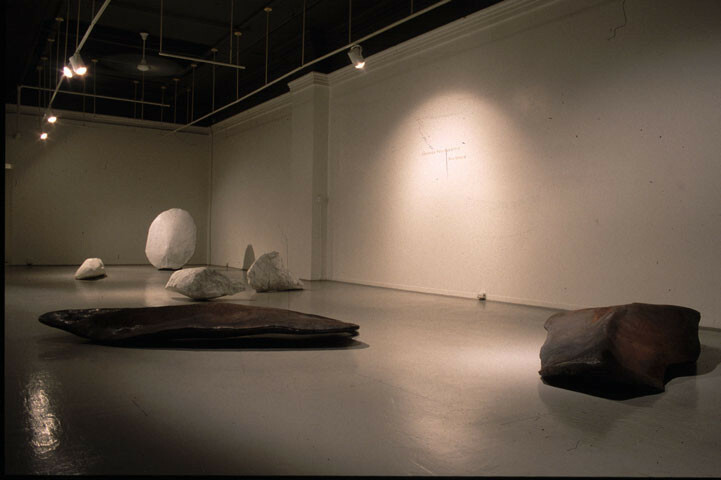 Both elements together in a gallery situation emphasize the importance of culture in reference to nature as a source and the dynamic that is inherent in this conflict. All my works point to the fact that the understanding of nature is a cultural thing. They draw on a positive engagement with form as well as oneself as cultural being. 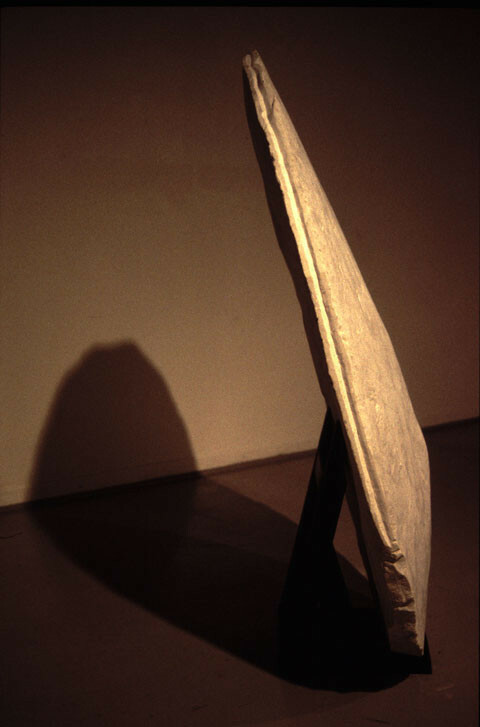 White Shadows, 1999, is the second piece in the gallery. It consists of two forms that are carved from white Italian marble. The surface is heavily marked, leaving patterns of tool marks on a richly veined surface. 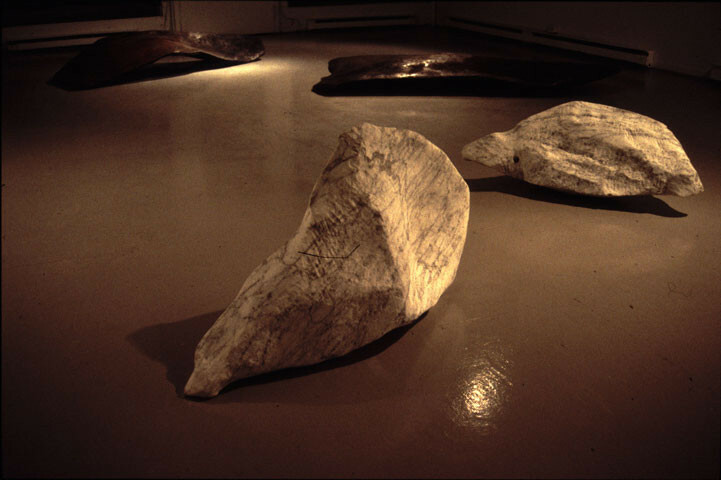 The pieces are amorphous forms that seem to relate to animal shapes like birds or fish, but could as well stand for other evaluations. They leave the viewer in doubt of what they are, but more so, of where they belong to. 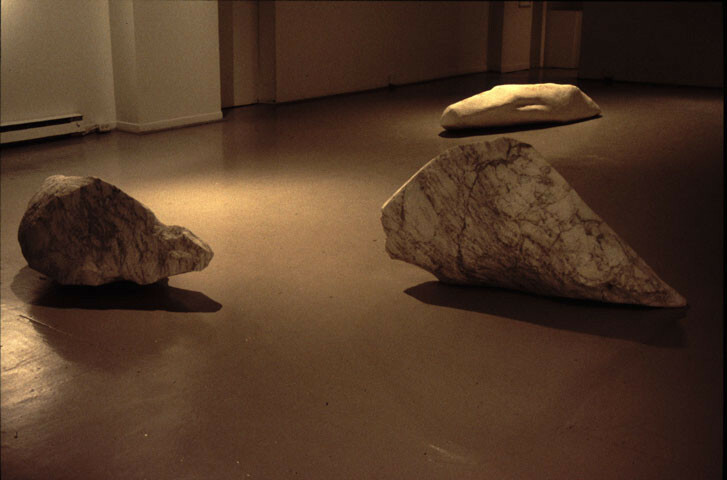 They rest on the gallery floor in such a way, that one is certain that they do not belong there. They seem to come from somewhere and will go somewhere else. Even though they have a powerful density and weight, they are not stable or firm. They appear to be moveable and balance in a moment of rest. 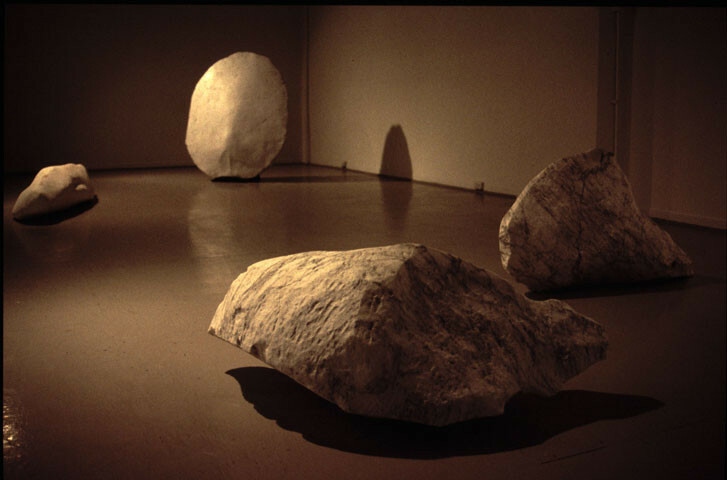 The duality of the nature of a shadow (as I described it earlier for the piece five shadows) is manifested in white stone. The piece is installed in close proximity to the third piece in the exhibition - "shields for a human" and I like them very much in relation to each other. Together the two pieces seem to complement "shield and shadow" in their understanding of a subjective sensibility. 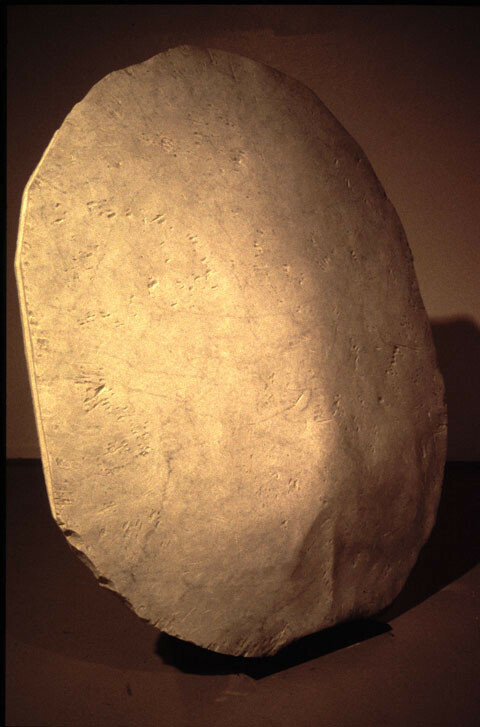 The Shields for a Human, 1999, are fairly large pieces in relation to the human body and are made out of plaster over wire. 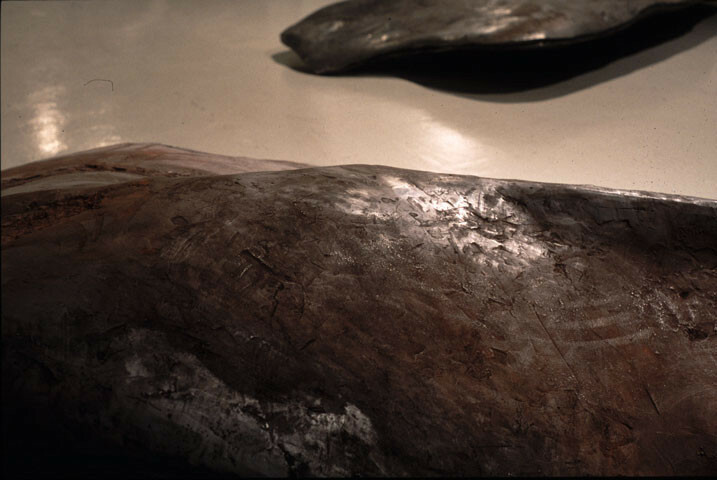 They are covered with iron oxide and graphite and have a dark, roughly marked surface. 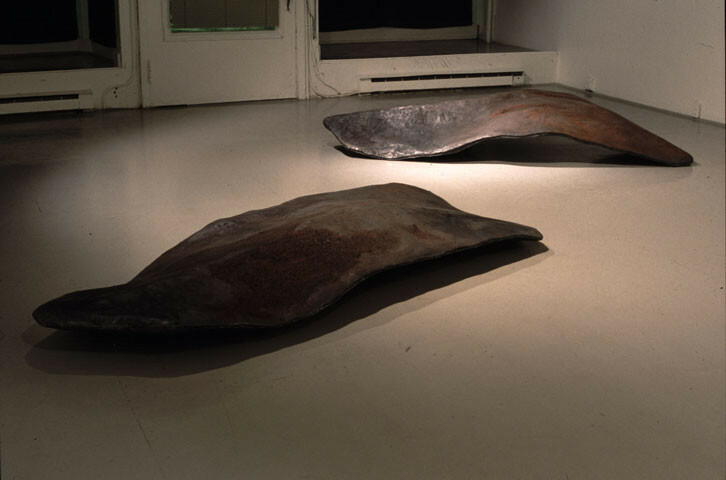 They are flat like shields, and their shape references reduced forms - as if they were made to cover a specific form. Yet, their very presence makes them "things" that deny any such function. About 2.30m long and more than a meter wide, they would easily allow a person to find shelter. As a thing - they do not invite you to move them in order to find enough space and room underneath or behind them. They refuse any defined reading of what they are made out of and how heavy they really are. Just like the "white shadows", they do not appear stable or rooted. Despite their size they seem to be taken away from somewhere and do not belong here. The forms draw attention to the moment of experience, the moment of an encounter that is contextualized in an individual reading. The encounter takes place between us as cultural beings - and these things as form. 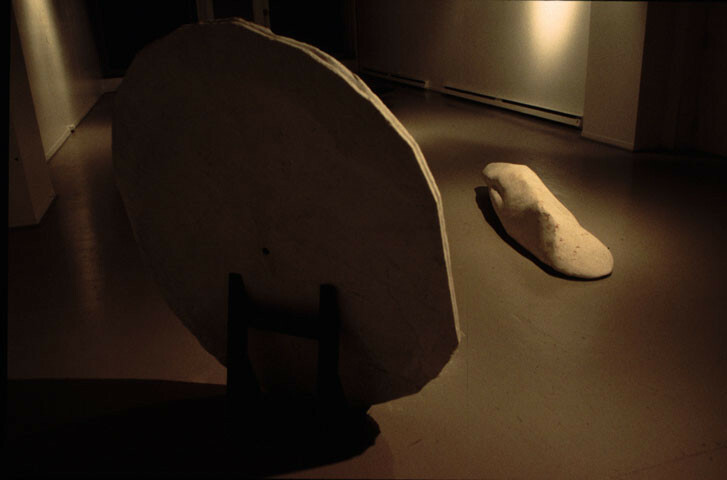 White Shield und Shadow, 1998-1999 spielt mit dem Widerhall des Menschlichen in Beziehung zu Natürlichem. Das White Shield wird hier in Verbindung mit einer zweiten, auf dem Boden ruhenden, Arbeit gezeigt. Dieses zweite Element ist eine amorphe Form, die ungefähr die Größe einer Person hat (180 cm x 50 cm im Durchmesser). Es ist rund und relativ flach am Boden, beide Enden laufen zu einer runden Spitze zusammen. Diese amorphe Form zeigt ihre Wesenhaftigkeit nicht durch eine lesbare Bildsprache, sie arbeitet mit einer Ähnlichkeit. Die Form ist in Gips über einem Drahtgestell gearbeitet. Unter der weißen Oberfläche ist eine mit rotem Pigment gefärbte Schicht, die teilweise freigelegt ist. Die Oberfläche ist straff, dabei aber wegen der noch sichtbaren Bearbeitungsspuren grob strukturiert. 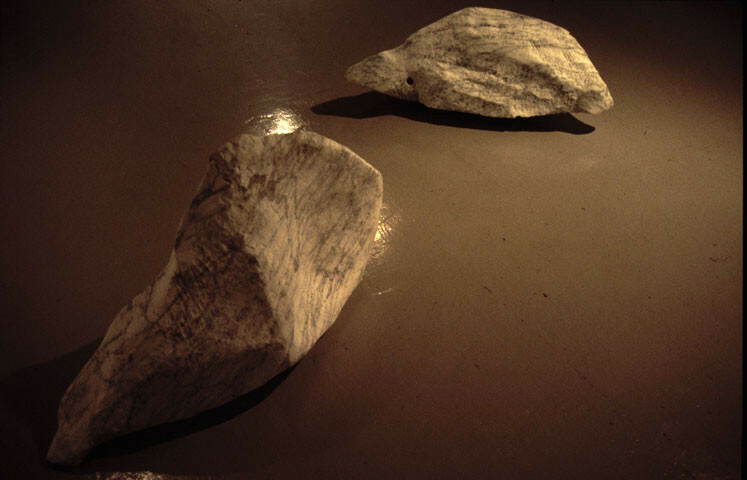 White Shadows, 1999, ist die zweite Arbeit in der Galerie. Sie besteht aus zwei Formen, die aus weißem, italienischem Marmor gearbeitet sind. Die reich geäderte Oberfläche ist voll von Spuren, hinterlassene Muster von Werkzeugen auf Stein. Die Arbeiten sind amorphe Formen, die wage an Tiergestalten wie Vögel oder Fische erinnern, könnten aber auch für eine andere Bestimmung einstehen. Sie lassen den Betrachter im Zweifel darüber, was sie sind, jedoch mehr noch darüber, wo sie hingehören (wie Vögel, deren Flügel man stutzt oder Fische, die man aus dem Wasser nimmt). Sie ruhen so auf dem Boden der Galerie, dass man sich bewusst wird, dass sie dort nicht hingehören, nicht zu Hause sind. Sie scheinen von irgendwoher genommen, um auch wieder zu einem anderen Ort zu gehören. Trotzdem sie schwere Klötze sind, undurchsichtig in ihrer Form, sind sie nicht stabil oder gefestigt. Sie erscheinen beweglich und nur in einem Moment des Gleichgewichts. Die Dualität des Wesens des Schattens (wie auch in "Five Shadows", 1996) ist hier in weißem, stark geäderten Stein beschrieben. 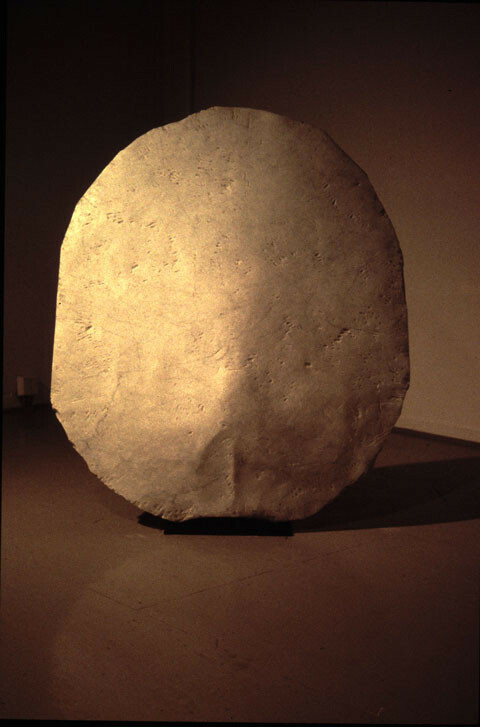 The Shields for a Human, 1999, sind kaum größer als eine Person, wirken jedoch so, da sie sich flach über den Boden erstrecken. Sie sind aus Gips über Draht gearbeitet und bedeckt mit Eisenoxid (Pigment) und Graphit. Ihre Oberfläche ist sehr dunkel und mit groben Spuren versehen. Sie sind flach wie Schilde und benutzen eine reduzierte Formensprache, scheinen gemacht für ein passendes, nicht vorhandenes Gegenstück, das sie bedecken würden. Ihre Gegenwart im Raum macht sie zu „Dingen“, die jede dieser Funktionen zurückweisen. Ungefähr 230 cm lang und über 100 cm breit, würden sie einer Person leicht erlauben, Schutz zu suchen. Als Objekte laden sie uns allerdings nicht dazu ein, sie zu bewegen, um unter ihnen genug Platz zu finden. Sie schließen jede Bestimmung dessen aus, woraus sie gemacht sind und wie schwer sie sind. Ganz wie die "white shadows" scheinen sie nicht bodenständig oder verwachsen. Trotz ihrer Größe scheinen sie von irgendwo entnommen und nicht hierher gehörend. Die "Shields for a Human" ziehen die Aufmerksamkeit auf den Moment der Erfahrung, den Moment einer Begegnung, der individuell lesbar ist und so in einen Kontext gesetzt werden kann. Die Begegnung findet statt zwischen uns – als kulturelle Wesen – und diesen "Dingen" als eigenständige Form.